The Amish of Lancaster County, Pennsylvania are generally acclaimed as some of the premier quilters in the world. Their fine craftsmanship and the ability to put together attractive color combinations have justly earned this outstanding reputation. We feature Lancaster County Amish quilts. Although historically the Amish have turned their back on new technology, they were quick to accept the sewing machine when it was invented in the 1800’s. Then, as now, a traditional Amish quilt would be pieced together using a sewing machine and then hand quilted. Although quilting bees have long been an important aspect of the Amish social life, the different stitching style used by each person working on the quilt can detract from the finished product. For that reason nearly every quilt we sell has been quilted by only one person. 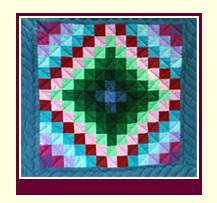 There are two styles of quilts, pieced and appliqued. Pieced quilts are made by sewing small straight edged pieces of material together. Usually the sections are assembled in such a way that an intricate pattern is formed. 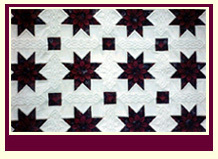 Examples of pieced quilts are the Log Cabin, the Lone Star, the Center Diamond, and most traditional quilts. An appliqued quilt starts with one large piece of fabric. Smaller pieces of fabric are then hand sewn onto it creating the pattern. These quilts are more intricate, use curved lines in their pattern, and will sometimes include some embroidery. Applique quilts are generally harder to make and therefore more expensive than pieced quilts. 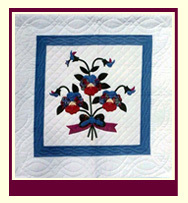 Examples of appliqued quilts would include the Country Bride and Country Love. 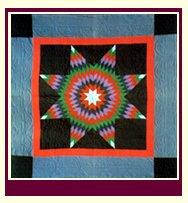 The traditional Amish Quilt is a pieced quilt using only solid dark colors, the same color used by the Amish in their clothing. Since a market grown outside the Amish community for quilts, the Amish have also begun to make the “fancy” quilt styles featuring appliqueing and/or printed fabrics. We carry both the traditional and the contemporary styles. Quilt Pricing – How much does an Amish Quilt Cost? There are a number of things that affect the price of a quilt. Size is obviously one aspect. A king size quilt will cost more than a comparable queen-sized quilt. 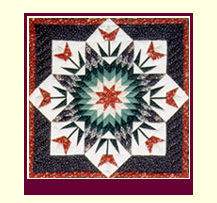 Appliqued quilts are usually more expansive than pieced quilts. A pieced quilt with smaller and more pieces will cost more than the same quilt with larger and fewer pieces. The amount of quilting will also greatly affect prices since it is usually the most time consuming part of quilt making. Not only does the amount of area covered by stitching affect cost, the tightness of those stitches can also have a big impact. A quilt that features eight stitches to the inch will have significantly more work in it than one with six stitches to the inch in it. Please note that these measurements are for the mattress top only – to buy a quilt that would look good on your bed, you will need to add more length so that the quilt hangs as far down the side of the bed as you desire. For example, if you owned a queen size bed and wanted your quilt to hang at least 15 inches down each side, you would need to buy a quilt that is at least 90 inches wide (60 in. mattress width + 15 in. drop on one side + 15 in. drop on other side = 90 in. total). To make it easier for you, we group our quilts by size so all the quilts that should fit your bed will be in the same area. We also have bed displays so you can see how a particular quilt will look on a bed of your dimensions before you buy it. Most of the quilts that the Amish make (and we sell) are made of cotton polyester, the same fabric they use in their clothing. Most of these quilts can be machine washed with cool water on the gentle cycle. When drying either air-dry or set the dryer on low setting with little or no heat. NOTE: Some dark fabrics (especially dark blue and burgundy) may bleed in water, so we recommend dry-cleaning quilts that have these colors. Wool quilts should always be dry-cleaned. Hi, my name is Dahlia. I’m one of the most popular quilts you’ll see in Lancaster County. People all over the country enjoy my puffy petals and they really like the cones that form my border. I’m the only pattern that has cones, so I’m very unique. This is my story. so she put the money Mary paid her for piecing quilts to good use. Katie took the fabric Mary sent her and cut it into the various shapes that form my pattern. Then she got out her treadle sewing machine and sewed all of my pieces together, taking special care to make sure all my seams were even and my pattern was symmetrical. When she was done, Katie put me into a box and gave me to a friend of hers who returned me to Mary’s when she visited her later that week. After Mary got me back, she took me next door to her daughter in-law Mary Ellen who marked the quilting pattern on me and then gave me back to Mary. Then Mary cut a large piece of fabric to make my back and a large piece of batting which went between my top and my back and made me nice and puffy. She then put me back into a box and shipped me to Anna, another Amish lady who lives near New Holland. Anna took me out of my box and carried me into her large kitchen where she has a quilting frame set up at one end, She put me (along with the batting and backing) in the frame. She inserted some pins and then started to stretch me. She put more pins in me and stretched me some more. This went on and on and on until I was stretched out as far as I could go. Finally she stopped, but just when I thought I could relax she took out a needle and thread and begun to stitch along the lines Mary Ellen had drawn. I spent weeks stuck in that rack being stitched by Anna. Finally she finished the last section and took me out of the frame. I was now covered from top to bottom with quilting. All of Anna’s work (and my suffering) was worth it. I was becoming one good-looking quilt. I have to admit though that despite my great beauty, I still felt a little rough around the edges. Mary must have felt the same way, because as soon as she got me back from Anna’s she sent me on a carriage ride to Sarah’s. Sarah is a widowed Amish lady who supports herself by binding quilts for Mary. Binding was the last major step in my creation and involved sewing an edging all around me. Because of all my curved edges, this wasn’t easy to do, but Sarah specializes in this kind of work, so she didn’t have any trouble finishing me. After Sarah was done with me, it was one more carriage ride back to Mary’s. Mary did one last inspection and determined that I was finally finished. It had taken four months and five Amish ladies to turn me from a pile of fabric to a completed quilt! 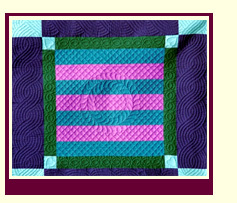 For most of the Amish women who make the quilts we sell, quilting is much more than a hobby. It is an opportunity to financially support their families without leaving home. For most of our quilters, our shows are one of their primary income sources. Our February/March shows are particularly important since they provide revenues when there is no money coming in from crops and very little sales activity for quilts in Lancaster County. If you look at the price tag on the quilts at our show, you will see we have listed the name of the person who provided the quilt. We have also included some brief biographical information on the supplier. The price tag is designed so you can cut the price off and still leave the rest of this information on it, a useful feature if you were planning on giving the quilt as a gift. For those who have a deeper interest in our quilters, here’s some biographical information on several of our major quilt suppliers. Mary is a long time friend and neighbor. Her family and ours have attended each others weddings, celebrated holidays together and helped each other in difficult times. Mary is the mother of six and the grandmother of an ever-growing number of grandchildren. It was Mary’s desire to find a new outlet for her quilts that ultimately led to the creation of Amish Country Traditions. Mary is an Amish woman from southern Lancaster County. She has ten children – six boys and four girls. Mary’s grandmother was a highly skilled quilter, who was well known for the meticulous detailing in the quilts she made. Mary has continued that heritage of quality, and today makes some of the finest traditional quilts found anywhere. Fannie is an Amish woman from southern Lancaster County. She was one of our very first suppliers of quilts. She lives very close to the farm where the movie “Witness” was filmed. If the Amish characters in the movie were real, they would probably have been members of the same church as the Fishers. Mary is an old order Mennonite woman from northeastern Lancaster County. Old order Mennonites are the most conservative of the Mennonites. Like the Amish, they travel by horse and buggy, however they use an all black buggy rather then the gray and black buggy used by the Lancaster Amish. Like the Amish, they also dress very plainly, although the Mennonites usually use printed rather than solid fabrics in their clothing. Emma is an Old Order Mennonite woman from eastern Lancaster County. She specializes in unique patterns and is one of the few suppliers of king size quilts. Copyright © 2009 - 2012 Amish Family Values. All Rights Reserved.